T1-MMY is a hovering orange rustbucket—a result of the mods and components I had lying around my home base. He sports a cryogenic blaster on one hand, and an oversized vice on the other. He’s also got a cartoonishly cheerful face and communicates through optimistic bleeps and bloops. His name doesn’t really mean anything other than that, if he was a person, he’d look like he was called Timmy. Maybe I can turn it into a backronym: Tier1-Mechanical Military, er, Yunit? No, that doesn’t work. Like Dogmeat, Timmy doesn’t judge me for picking locks or stealing telephones. And, unlike Dogmeat, I can attach a flamethrower to his hand. He’s the result of Fallout 4: Automatron’s robot workbench, which lets you construct metal pals from your spare scrap materials. It’s an excellent addition. Rather than keep to the world’s standard templates, the workbench lets you mix-‘n-match parts—an Assaultron head here, a Protectron arm there. There’s a wide variety of different shapes, weapons and tools, and you can even modify the voice. It’s hardly essential. Fallout 4 already has plenty of companions, after all. But there’s something about constructing your very own Frankenbot that taps directly into Fallout’s weird science. It fits with the established tone, and nicely complements the Sole Survivor’s skillset. If robot crafting was all there was to Automatron, I’d feel more positive about the whole package. It’s not, though, and the price reflects that. There’s also a short (about two-hours) quest chain. It starts with a distress signal that leads you to Ada—a robotic companion whose friends have been killed by the robotic army of the Mechanist. Robots, if you haven’t yet picked up on the clues, are the central theme of this DLC. The story takes you through a couple of new ruined buildings—one full of raiders and robots, the other full of robots and other, slightly different robots. Along the way you’ll pick up some new weapons, including a Tesla rifle that fires lightning that chains between foes. There’s also some new armor. It’s a little more of something you’ve already done a lot. It sounds like I’m being reductive, but it’s hard to get enthusiastic about more dungeon crawling through the decrepit ruins of a post-apocalyptic Boston. Fallout 4 is already packed full of that. It’s a little more of something you’ve already done a lot. It does, admittedly, offer a fun, campy story that—especially in the laboratories of the final building—still manages some dark plot beats. Robot experimentation is hardly original grounds for science fiction, and Automatron isn’t trying to do anything new. But it’s all wrapped in Fallout’s ’50s aesthetic, and hits an enjoyable B-movie tone. 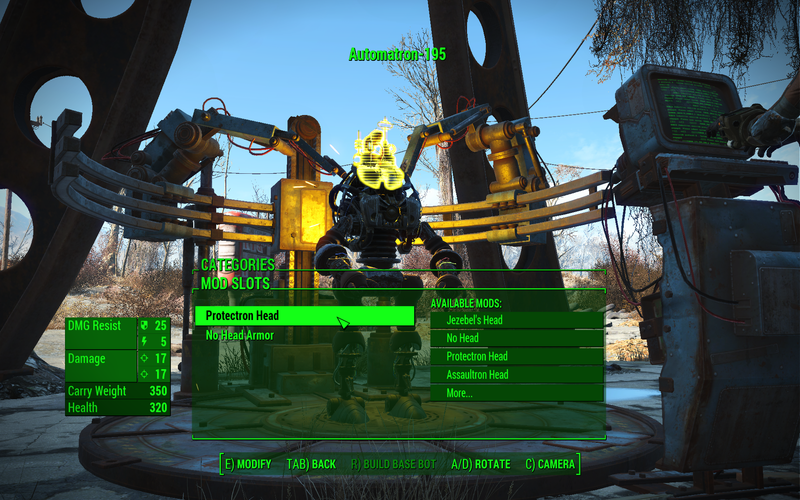 Hence, if Automatron was a sidequest within the base game, it’d be one of the better ones. As an add-on, though, it doesn’t have the conceptual strength of, for instance, Fallout 3’s DLCs—Operation: Anchorage’s military simulation, or Mothership Zeta’s spaceship. They weren’t always good, but they did at least make sense as additional chapters separate to the main game. Automatron doesn’t—at least not its questing. The new enemies are good, at least, and nicely compliment the combat. Like my own creations, they’re cobbled together from a variety of parts—a ragtag bunch sporting different frames and weapons. It adds variety to encounters when even a room full of basic junkbots could utilise numerous combat styles. The resolution is perhaps a little too combat-centric. I won’t spoil anything specific, but will say that there’s a misunderstanding that leads to a wave-based arena-style fight. If ever Fallout 4 needed a charisma check to let you talk down an opponent, it’s here. I’m glad I have Automatron, because now I’ve got T1-MMY—a robot friend to accompany me on future adventures through the Commonwealth. Robot crafting is a good idea, and well executed. But it’s tied to an adventure that just isn’t all that adventurous. It’s a pleasant addition, but doesn’t do enough to justify its existence as a $10/£8 add-on.